Theme kits will be released every two months. As Europe are going back to school, this months Theme is ‘School’. 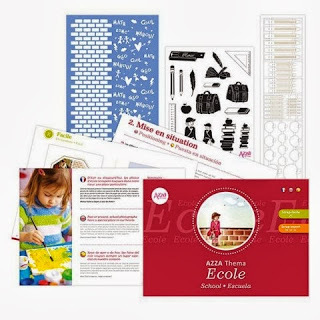 The kit comes with an instruction booklet (French, English and Spanish), a set of stamps, a texture stencil and a sheet of lace figurines. All items from the kit will be available for purchase separately one month after the kit has been released. The only item only available in the kit package and not on its own is the Instruction booklet.